It sounds like a simple question, but history shows the answer is far more complicated and varies by perspective: "What makes a good race?" According to Dale Earnhardt Jr., and confirmed through other attendees, that was the first topic of the first NASCAR drivers council meeting last month at Dover (Del.) International Speedway. "For the last probably 10 years we didn’t even know what a good show was. 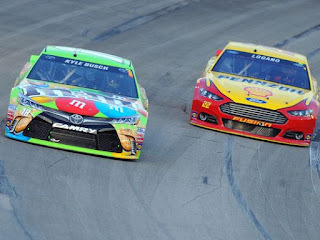 The drivers had an opinion what a good show was, NASCAR had an opinion what a good show was and it might not still be the same thing," Earnhardt said Friday in an interview at New Hampshire Motor Speedway. To address many of the issues facing the sport, Earnhardt said drivers and NASCAR all had to get on the same page as to what each was trying to accomplish. The first starting point was a logical one. "The two sides might now be the same, but they were never in a room together years ago. 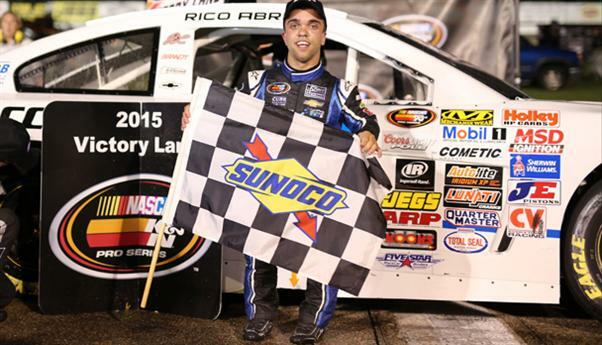 So, we can sit there and talk about aero packages and what kind of racing it might present and now we’re seeing these packages get implemented on the race track, which is pretty crazy," he said. "I never ever thought that they would go allow us to run this low downforce package. I just, we wanted it and asked for it and asked for it and it really never got any legs." When the discussion ended on the first topic did drivers and NASCAR find their views on what makes a good race were different? "I think so. NASCAR I think wants pack racing and drafting and passing. 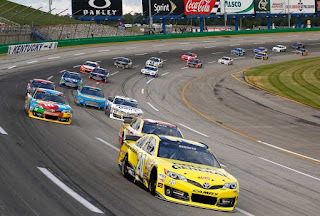 Tons of passing, tons, tons - if they could pass every straightaway at speed that would a great show for NASCAR, which it would be great to watch," Earnhardt said. "I think the drivers' opinion of what a great show is, is a bit old-school. Something from the '80s and the '90s. Not necessarily in the fact that fifth place was a lap down, because that stuff is not going to happen these days because the sport is too competitive. But off-throttle time, guys sliding around, tires wearing out, tires not making a fuel run, having to really take care of it.That's the kind of thing we want to encourage." 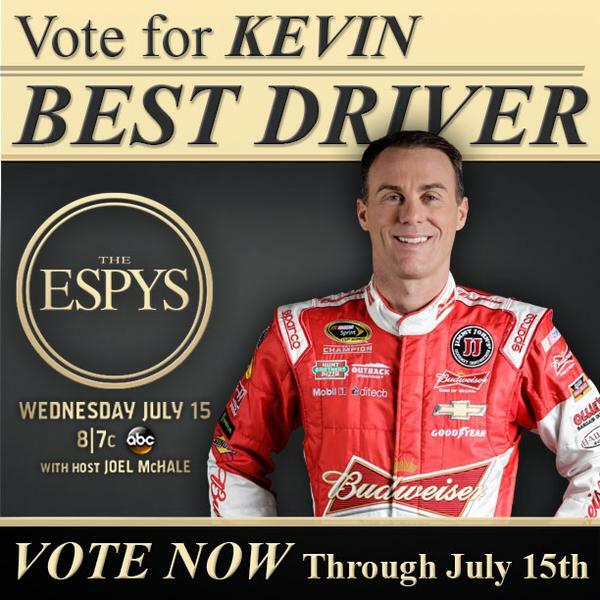 Reigning NASCAR Sprint Cup Series champion Kevin Harvick’s dominating year on the race track earned him an ESPY for ‘Best Driver’ Wednesday night at the 23rd annual ESPY Awards show presented by ESPN. Last season, Harvick earned five victories, six runner-up finishes and 14 top-five finishes en route to his first Cup title, clinched in walk-off fashion in the season finale at Homestead-Miami Speedway with one of his five wins. Harvick also set six track qualifying records and earned a series-best eight poles. Harvick’s career includes 90 wins across NASCAR’s top three series – Cup, Xfinity and Trucks. 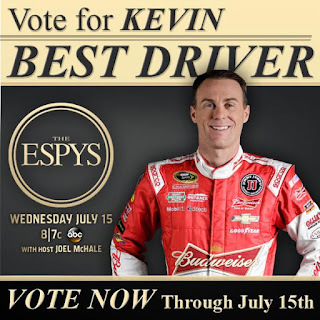 Now in his 13th year, Harvick joins a list of stock car drivers who have won the title of ‘Best Driver’ since the awards began in 1993 including Tony Stewart, Dale Earnhardt Jr., Jeff Gordon, Jimmie Johnson, Bobby Labonte and Dale Jarett. 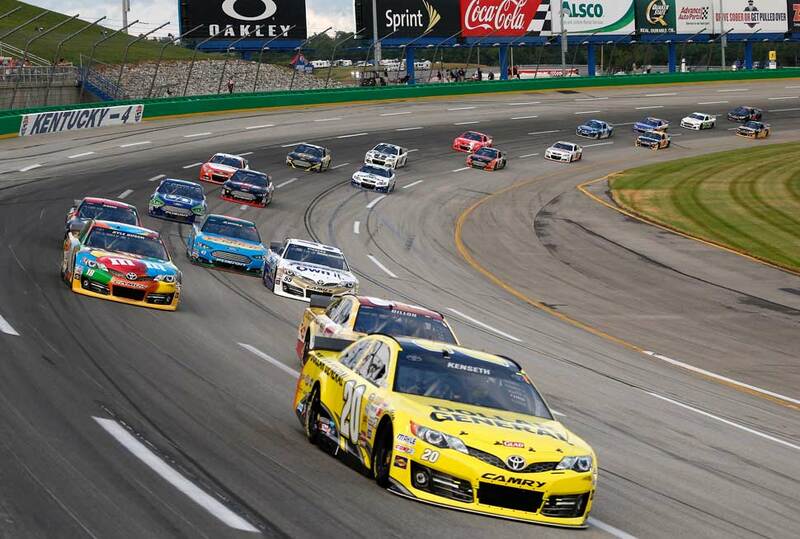 Could NASCAR's safety solutions have applications to other professional sports? 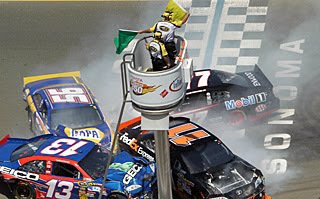 As NASCAR begins its investigation into Monday's last-lap wreck during the Coke Zero 400 that tore a giant hole in the frontstretch catchfence at Daytona International Speedway which left five fans injured, it's possible any new solutions that arise could be applied to other professional sports. 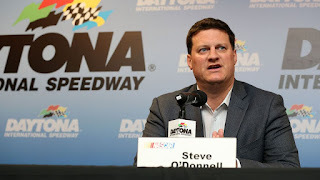 Steve O'Donnell, NASCAR's executive vice president and chief racing development officer, was asked Tuesday about the work being done on any 'next-generation' catchfence solutions and whether something new was on the horizon. O'Donnell opened the door to searching for new technologies that could be applied to any sport with a playing field. "I think the catch fence, first and foremost, is there to obviously keep the car from going through, and I think it did that. I think the next iteration that we would look at, it may not be a fence make, but what are the new technologies that are out there," he said. "I think this is an area for all sports to look at, with anything either flying away from a playing field or a racing surface. If we can lead in that area, we want to do just that. I wouldn't make it specific to a fence. There could be a lot of new technologies that we could look at collectively with the tracks to make some improvements in that area." Could some form of franchising be in NASCAR's not-so-distant future? 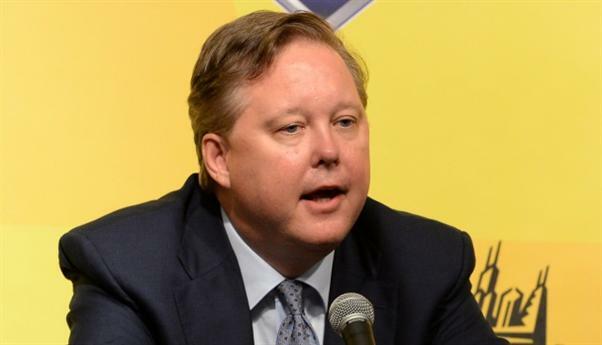 In an appearance Wednesday afternoon on SiriusXM NASCAR Radio, NASCAR Chairman Brian France seemed to open the door to some sort of franchising model for NASCAR teams that would provide invested team owners with equity outside of the car parts and machine tools that fill their respective shops. Asked by Sirius host Dave Moody for his take on the status of talks on the issue, France said, "It's in our best interest to have healthy team owners who have the best opportunity to field quality race teams. That's a goal that we've had for a long time. That remains. In any way we can do to benefit that business model and create more opportunities for ownership, for example, whatever we may be, all of those things are what are being discussed. It's not a new direction. We are taking a little bit more of a formal look at that. Whatever we can come up with that benefits our team owners, their business models and creates a healthier and more competitive NASCAR, that's in our best interest." Asked how far along the talks are, France said, "These are complicated matters. They aren't new. What is different a little bit is that we're formalizing these discussions so we can accelerate these ideas. Directionally, in our best interests of course to make sure our team owners are healthy. They've said they have a lot of challenges right now. We're listening to that because they are one of the most important stakeholders in NASCAR."